Pulp Fiction has achieved ultimate cult film status and so has a particular dish–or rather, beverage–for that matter. Uma Thurman’s blunt-bobbed character orders the five dollar shake at Jack Rabbit Slim’s before the movie’s infamous dance scene between Thurman and John Travolta. Even die-hard Pulp fans are left wondering what the ingredients of the shake are. Our guess? A flavorful mix of ice cream, milk and a dash of vanilla. Honorable Mention: The movie’s Royale with Cheese—Travolta and Samuel Jackson exchange a playful banter while driving to their next mission, with one explaining to the other that in France, a McDonald’s Quarter Pounder is called a “Royale with Cheese,” since they only understand the metric system. A Disney film that has both charmed our imaginations and our stomachs. Ratatouille centers on Remy, a Parisian rat who dreams of becoming a chef. In the film, Remy cooks ratatouille for a food critic, which immediately brings the food critic back to his childhood in the French countryside. The eponymous dish of the film, which originates in Southern France, is a vegetable-based stew that is usually cooked in oil. The vegetables commonly used in the dish include zucchini, peppers, tomatoes or eggplants. The dish is versatile; it can be served hot or cold. In traditional Wes Anderson fashion, The Grand Budapest Hotel tells the story of a now-decrepit hotel in its heyday. The hotel’s concierge, Monsieur Gustave H., embarks on a journey with his lobby boy, Zero, to prove his innocence for a murder he did not commit. 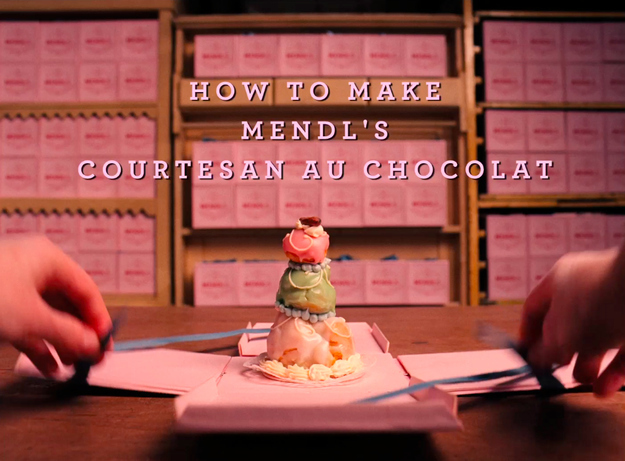 Zero’s girlfriend, Agatha, works at Mendl’s Bakery, famous for its courtesan au chocolat, a desert comprised of cream-filled profiteroles glazed with chocolate. When Zero and Gustave are in prison, Agatha hides weapons inside of the dessert during one of her visits. The dynamic duo are then able to escape from prison and continue their journey. Perhaps the most well-known couple in animated movie history, Lady and Tramp have won both our hearts and our stomachs in what is now an iconic cinema moment. The pups slurp away at a bowl of spaghetti and meatballs, solidifying their love for each other and making us swoon in the process. It truly is puppy love. Though spaghetti and meatballs is an iconic and staple Italian dish, over the years it has become synonymous with this Disney classic. The scene proves that all you need for a romantic night is a red checkered tablecloth, some candles and a heaping bowl of pasta. The story of Matilda is one filled with neglectful parents, terrible teachers and a girl genius with a knack for reading. Matilda, with her wit and cunning personality, has served as a kind of spirit animal for generations of young girls. Matilda’s classmate, Bruce, is punished in front of their class for stealing and eating a piece of chocolate cake from the office of the cruel Trunchbull. Bruce’s punishment? To eat an entire chocolate cake (to be honest, this doesn’t seem like much of a punishment to us). He perserveres and finishes the dessert to the shouts and rallies of his fellow classmates.